Bedford CF Van, 9700 Series All Holden 6 Cylinder. International Truck A Line, C Line, D Line 1969-1980 6 Cylinder Petrol. FUEL & OIL. Rover 3.5L, 3500, 3500S Sedan, Coupe 1967-1970 3500 V8. Range Rover 1972 V8. BEDFORD BLITZ 1.8 2.0 2.3 NR OE: FP10080 7.21440.51.0 7.20036.00.0 721440510 720036000 4028977325250 0453-13-350 045313350 A0020910001 060906089 others h=83 mm L=133 mm d=38 mm 0,2 Bar 95 L/s. Hillman Husky 1958-1962 -. Bedford Truck All models 1935 -. CA 7 ½, 12 Ton 1962-1964 6 Cylinder petrol engines. 2 Ton, 5 Ton 1953-1957 Petrol engines. Karrier Bantam 1946-1963 Petrol engines. LD1 1 Ton, LD2 1 ½ Ton, LD5 1 ½ Ton 1954-1960 Petrol engines. Fuel Mixture Formation: - Carburettor. If the item is used, we are unable to accept the goods back. IN DOUBT WHETHER IT WILL FIT?. AND WE WILL DIRECT. NUMBER BEFORE BUYING. We always will do the best for both sides to be happy! BnC Presents: HEAVY DUTY FUEL PUMP. BnC Number: BNC12890. Are you worrying how to proceed warranty if you are from different country?. For details seeWarranty Policy. Product Type: Fuel Pump. 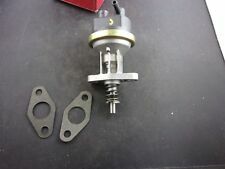 1x Fuel pump. AEC engines OE370 & OE400 as in Albion; Dodge; Leyland with C.A.V. diesel injection; 1963-65. Albion Truck with Leyland OE370 and OE400 engines; 6.1, 6.6L with AC Pump 1960-70. Albion Reiver 6.6L with AC Pump 1963-65. Holden Commodore VB 11/78-2/80 6 Cyl 2.8 & 3.3L VD : VL OHV 12V Carb RWD Without Glass Bowl. NECESSARY INFORMATION : Dont forget to provide us the the vehicle infomation, if you need assistance in buying the part. (B2C) 05.85 - 09.89 Saloon 81 110 1567. B1B) 09.85 - 06.89 Saloon 85 116 1779. BA) 05.85 - 10.88 Saloon 94 128 1962. A1A) 10.84 - 07.87 Saloon 85 116 1779. A1H) 10.84 - 12.89 Hatchback 63 86 1351. A2) 07.86 - 12.89 Hatchback 75 102 1490. BEDFORD VAN < span class = notranslate ' > Diesel ENGINE PERKIN S 4-108 FROM 196 9 IN 1973. Pump DIESEL FUEL OIL. activities As ' Line not carry we The Withdrawal of A hand ' object. In the year HONEST PERSON and are here to work, and are NOT Wrong Infallible. Produkttyp KRAFTSTOFFPUMPE. Produktart Elektrisch. Steering column switch. GT 1968-09 - 1973-08. Wheel Bearing Kit. PDC sensors / parking aid. Oil level sensors. Oil separator. Fitting Position in fuel tank. CHEVROLET 5815014. CHEVROLET 90412220. CHEVROLET 90442231. CHEVROLET 90442402. CHEVROLET 93181358. Use engines info and vehicle YMM compatibility chart for general guide. Bedford K M O Trucks (From 1940- 53) (Petrol Models Only). This kit includes several different pump / block gaskets as it's used on lots of different cars. Here's a newFuel Pump Repair Kit for the following models fromBedford -. Bedford JO Van 2.6 (1960- 66). (Petrol Versions Only). This kit includes several different pump / block gaskets as it's used on lots of different cars. Here's a newFuel Pump Repair Kit for the following models fromBedford -. Equivalent to part number We just want you and your car to be happy! You'll have the part ASAP. We will always attempt to rectify the issue as fast as possible! Eg, Vetech, Erst Klassig, Franzen, NK, etc. Holden Commodore VC 6/80-10/81 4 & 6 Cyl AII Engines Without Glass Bowl. NECESSARY INFORMATION : Dont forget to provide us the the vehicle infomation, if you need assistance in buying the part. PART CHECK AND CONFIRMATION.